This past weekend I took part in Ludum Dare 17. Ludum Dare is a periodic informal competition where participants make a game in 48 hours based on a certain theme. 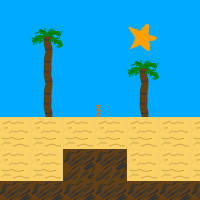 This time, the theme was “Islands.” By the end of the weekend, I created a game called “Waves,” which can be played on my site. Kayla Kinnunen posted a postmortem of her own experience, and I thought it would be fun to do one of my own. Note that the work-in-progress builds linked below will probably require you to click on the game to give it focus before it will react to your keystrokes.